Pete Michael demonstrates how easy it is to remove a Hail Buster from one of his raised beds. When in use, the corner posts hold it above the foliage. Photo by Barb Gorges. How bad was the hail damage in your garden this summer? Pete Michael also busts bad guys for a living. As the Wyoming attorney general, he’s the state’s chief law enforcement officer. As it turns out, he’s perfected a system for keeping hail behind bars. Well, bouncing off half-inch hardware cloth, anyway. One popular hail protection device used around town is what I think of as the “duck and cover” method. At the sound of the first hailstone on the roof, you duck outside and cover your garden with a tarp or blanket, hopefully not getting injured yourself. One variation is to install a series of poles in middle of the garden ahead of time so that the weight of the covering and the hail doesn’t flatten the plants. Another variation is the one my husband, Mark used. He is growing all our tomatoes and most of our eggplants and peppers in containers this year. He runs out and drags them under the patio roof. Hail shredded this rhubarb leaf in minutes. Photo by Barb Gorges. The problem is that you may not be home when hail hits. Or you may not be quick enough, or the tomatoes have gotten too big to lug around. Thus, in our garden we had scars on the tomato stems, shredded rhubarb leaves and a puddle of rose petals. The first contraption Pete showed me that he’d built was essentially a “low tunnel,” often used for season extension. His is a 16-foot long portable wooden frame 3 feet wide that sits on the ground. Plastic tubing meant for circulating water in radiant floor heating makes 2-foot high hoops spanning the width at 18-inch intervals. The ends of the hoops fit into attached 6-inch lengths of electrical conduit pipe. 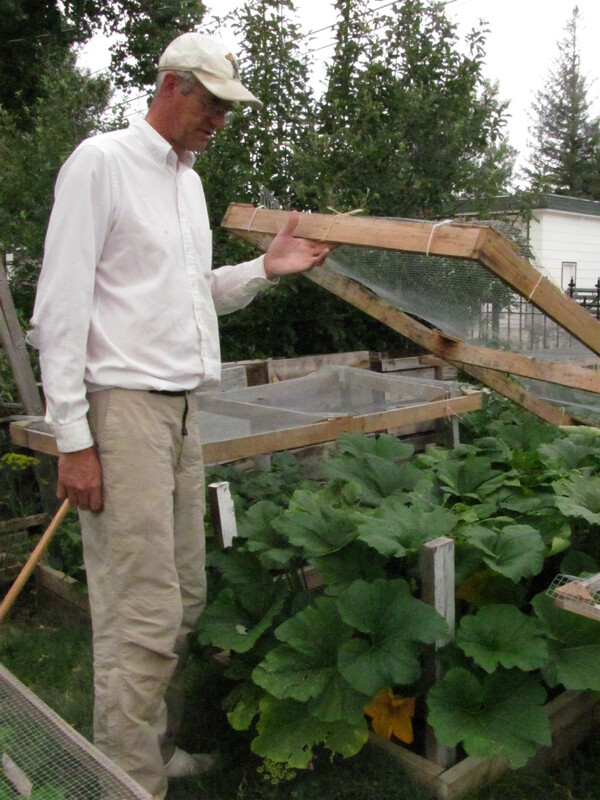 A portable low tunnel saved one of Pete’s squash plantings from hail devastation. Sections of electrical conduit hold the ends of plastic tubing hoops. Photo by Barb Gorges. The whole thing is like a covered wagon with white polyester floating row cover (he uses Agribon) stretched tight and kept in place with strips of lathe nailed over it around the wooden frame. The long loose ends are pulled together and staked out to keep the wind from lifting the frame. Pete is growing fancy squash that profited from the extra heat of being covered. And it was protected from the hail July 13—though the cover material is now shot with holes. Pete is a serious vegetable grower. He says he’s tried growing just about every vegetable imaginable. His backyard is filled with raised beds 3 feet wide (same width as the hardware cloth comes) by either 6 or 8 feet long. Each has a hail busting wooden frame made with one-by-twos in the same dimensions as the raised bed. 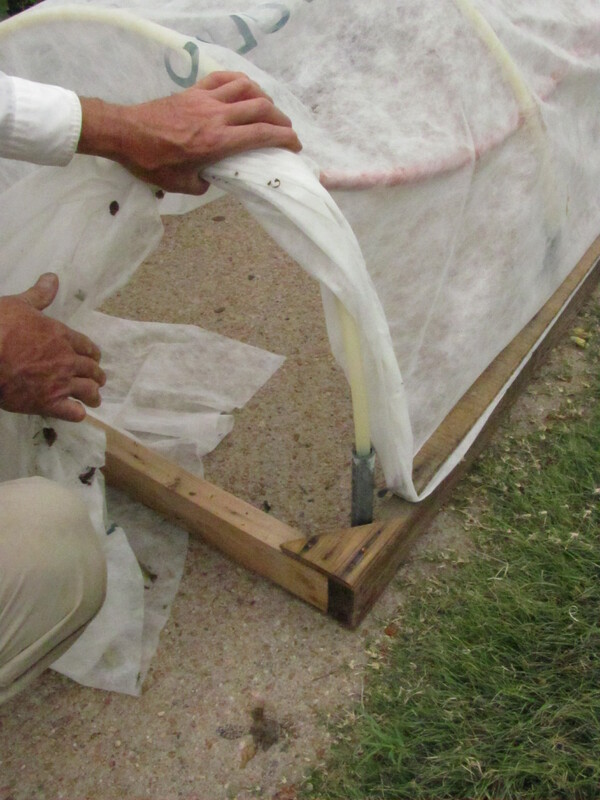 The frame is screened with the half-inch hardware cloth, wire screen with half-inch openings. It stops a lot of hail or at least slows it down so it is less damaging. He built everything with salvaged lumber, but he did say having to buy a roll of the hardware cloth was a bit pricey. I have seen other gardens built with screen roofs. The difference here is that the roofs, the Hail Busters, can be set at different heights depending on plant growth. The tomato cages in one raised bed are sturdy enough that the screen lays on top of them. In other beds, several stakes planted in the bed support the screen. When it’s time to tend the plants, the screen can be set aside. A lot of hail comes sideways, but these beds are close together, offering some protection. Hail protection turns out to be only one use for these screens. Two raised beds become cold frames in the fall. Their screen tops, built with more substantial 2-by-4s, are hinged to the raised beds on one side, then covered with salvaged clear plastic. Pete finds much of his salvaged materials just from being observant. Early in the growing season, when birds might otherwise steal the seeds he just planted, Pete can lay the regular screens directly on the raised bed frames. When tender seedlings emerge, the screens keep the bunnies out. And when starting cool season lettuce in August, the screening itself, or some added floating row cover, can give them necessary shade. In the fall, floating row cover—or blankets—are easily supported to protect vegetables on freezing nights, extending the growing season. Growing vegetables under cover is one thing, but no one who admires flowers would want to look at them through Hail Busters unless they were growing a valuable crop for market or seed. Pete does grow flowers, without cover, including a magnificent stretch of hollyhocks in the middle of a vegetable bed located between the sidewalk and street. They were a little worn looking from the hail two weeks before, as were the thick bunches of Shasta daisies growing around the house. The big beds of penstemons at the front gate had gone to seed. His secret is to grow perennials. Annuals, which people plant at the beginning of the season and which are supposed to bloom continually until they die in the first frost, are easily wiped out by hail. But, he said, perennials bloom in waves—if you are strategic. Say your penstemons are at their peak when the hail comes and knocks off all their flowers (their stems tend to be tougher than your average annual). After the storm, you can decide whether they look bad enough to cut back, or if they just need a bit of trimming, leaving them with plenty of green to continue photosynthesizing, storing energy for next year. But coming up behind the penstemons might be your daisies. At the time of the storm, their buds were small enough to be missed by the icy missiles. 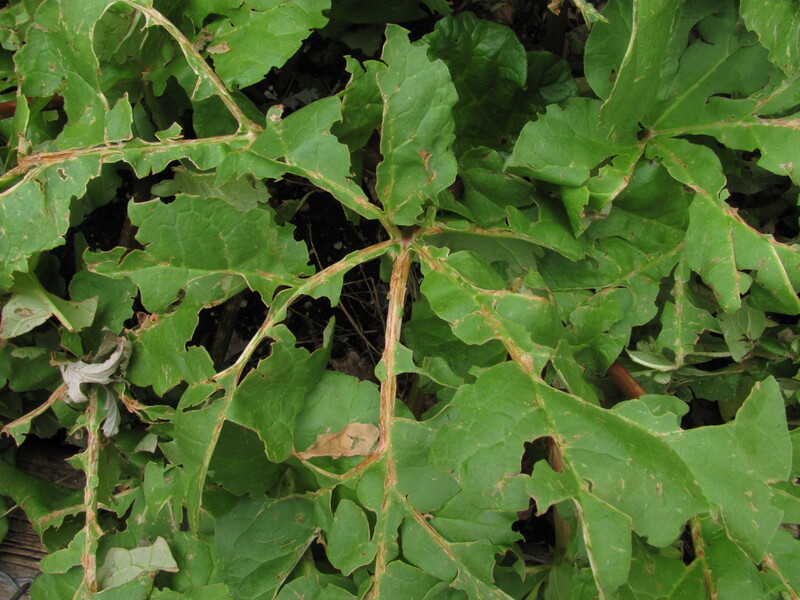 And if you choose perennials with skinny leaves, they aren’t as much of a target for hail. Pete also has a very nifty greenhouse with 5/16-inch glass touted to be hurricane resistant. He has lots of progressive ideas on organic gardening, which he admits he gets from his son, who with his wife, has a Community Supported Agriculture operation. It’s the Hail Busters though, that keep hail away and give Pete peace of mind. 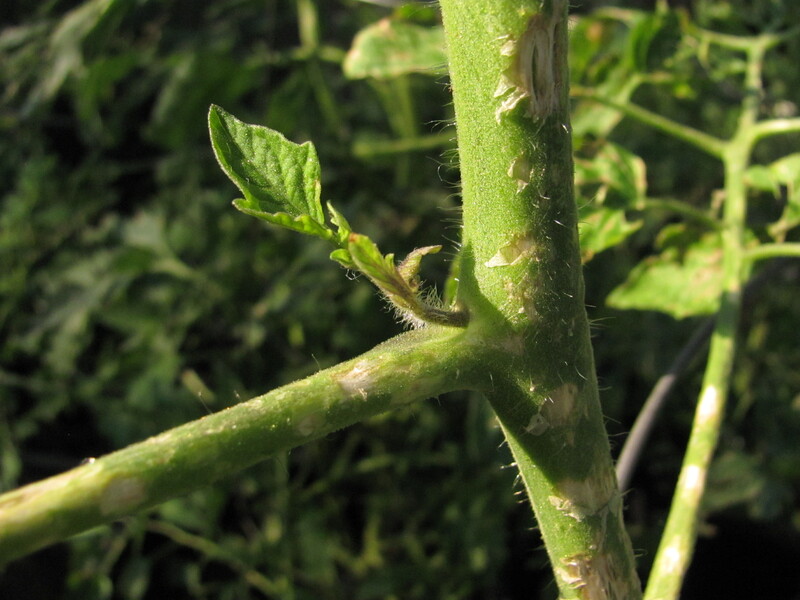 Though hail has scarred the stem of an unprotected tomato plant, two weeks later, a new shoot shows it is on its way to recovery. There may be time to grow a tomato before frost. Photo by Barb Gorges. Categories: Flowers, Gardening, hail, Hoop houses, Season extension, Vegetables | Tags: Gardening. hail, hail protection, low tunnel, perennial flowers, raised beds, season extension, vegetable gardening | Permalink.